If COLLAGE is your thing you should read this post. 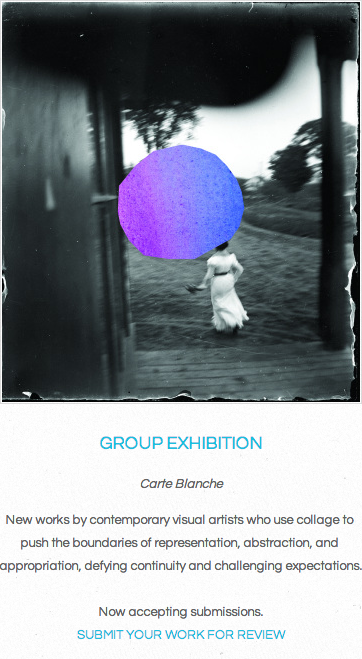 Central Features seeks submissions of collage artworks to be considered for inclusion in Carte Blanche, a group exhibition of works by contemporary visual artists who use collage to push the boundaries of representation, abstraction, and appropriation, defying continuity and challenging expectations. Artwork must have been created after 2009 and available for consignment. If selected, artist agrees to arrange for artwork to arrive at Central Features no later than October 20, 2014. Residency in Saratoga Wyoming? We think YES! Brush Creek Foundation for the Arts offers time and space for artistic exploration through immersion in the extraordinary beauty of the West. Located on 15,000 acres of scenic splendor at the base of the Medicine Bow National Forest outside of Saratoga, Wyoming, the camp is situated right next to Brush Creek, in between the Sierra Madre and Snowy Mountain ranges. Writers, visual artists, performance artists, musicians and composers are encouraged to apply for our four week artist residency programs, complete with lodging, meals, working facilities and incredible natural beauty. Two and six week residency options are also available; however priority will be given to the applicants applying for four week residency programs. Residents are at liberty to structure their own time and activity while on a creative retreat. Whether solitude or social engagement is inspiring, the opportunities for creative enrichment are endless at Brush Creek Foundation for the Arts. 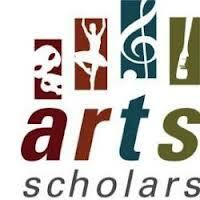 The Brush Creek Foundation for the Arts offers two sessions per year. The Winter/Spring artist retreats run from January – May with the deadline September 15 of the previous year. The Summer/Fall session runs from June – November with the deadline on March 15 of the same year. Options of 2, 4 or 6 weeks are available with preference going to 4 week requests. Duration is determined by jury rankings, overall application packet and schedule availability. The application processing fee is $35 and is nonrefundable. Hopkins Hall Gallery has designated its gallery space for student, faculty, and alumni projects and performances for the summer of 2014. Projects will be scheduled for the summer calendar starting with the first week in May. The gallery will feature short-term projects including: performances, installations, audience-participatory work, lectures, and public programs or activities. As a special projects and performance space, Hopkins Hall Gallery will be transformed, used, and returned to its original state in periods of one day up to two weeks. Ohio Art League members William Randall and Diana Abells are both exhibiting shows later in the summer months. Stop in to see “HOT CORN, a public information session” with William S. Randall and Ian Mackaye from June 3- 5, with an Opening Reception June 5 at 3 pm. Diana Abells, along with Pete Morgan, exhibits Unfolding the Periphery July 22- 25. In the immersive installation Unfolding the Periphery, viewers are invited to move through a constructed set that challenges their perception of the space. The Reception takes place Thurs. July 24 at 3 pm. The Hopkins Hall Gallery is open Tuesday through Friday from 11 am to 4 pm, and during the Summer Series, Receptions take place every Thursday at 3 pm for the corresponding exhibition. Click here for information on other shows or to find out more about the OSU Hopkins Gallery. Kelsey Finnie, a 2013 Ohio State University graduate, kickstarts Glass Axis’ “Student & Recent Graduate Showcase Exhibit” series with her Spontaneous Actions: Doodles in Glass exhibition. Finnie’s exhibit is a three-dimensional personification of the act of doodling on a page as she lets the artwork create itself. Kelsey explores the use of glass cane, which is traditionally used as a surface decoration in vessels, to draw through space. Finnie’s free form cane doodling leaves the margins of her notebook to create an all encompassing experience of walking through a drawing. The exhibit is presently on display in the massive Glass Axis art center through April 26. Whether you are a fellow alumnus of Finnie, want to show support for young adults expressing their ever-expanding ingenuity, or care to explore the adventurous talent of the artist, the enthralling Spontaneous Actions: Doodles in Glass is sure not to disappoint. For more information on Kelsey Finnie, click here to check out her website. For details on the exhibit or information about upcoming events, visit the Glass Axis homepage. Visit Hopkins Hall at OSU! 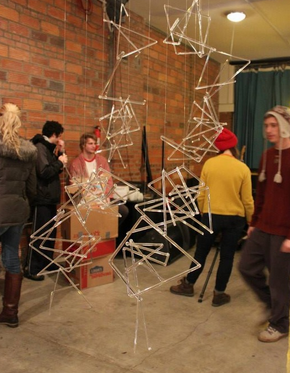 Make a visit to the 2014 Arts Scholar Juried Exhibition and help support the students of OSU. The Arts Scholars Program is comprised of high-achieving Ohio State University undergraduate students from all years of study who share a joint interest in the arts, including music, visual arts, design, dance and theatre. Students major in many areas across campus, including many non-Arts majors. The Annual Juried Exhibition features works selected by faculty to demonstrate the variety and diversity of talent in the program. This year’s show features photography, painting and drawing, digital art, ceramics, and animation. Juried awards are sponsored by the Aida Cannarsa Snow Endowment. This years faculty jurors consists of George Rush, Winnie Sidharta Ambron, & Karl Whittington. This years student artists consists of Arin Carver, Megan Chamberlain, Emmily Chang, Shrie Dave, Amanda Dobson, Jenny McCarthy, Olivia Miller, Sierra Mollenkopf, Devyn Pechnick, Anya Qiu, Jasmine Rajavadee, Michelle Vieira, & Jay Young. All artists and printmakers living within the Columbus OH area are encouraged to apply to our new artist in residence program. *Printmaking knowledge is a plus but not required. The terms of the residence allow for access to all the printmaking equipment and facilities housed at the Ohio State University’s Printmaking Department. This includes Screen printing, Relief, Intaglio and Lithography. Ink and paper and other disposable materials are the responsibilities of the artist. The residency will last for duration of one month beginning at the first of the month and ending the last day of said month. While in residence artists are required to be present in the printmaking shop at least one day per week with a minimum of 6 hours per week of shop presence (these hours can be spread out amongst several days). This to be worked out between the artist and the Student Printmaking Association. Any other hours spent in the shop are left up to the artist. 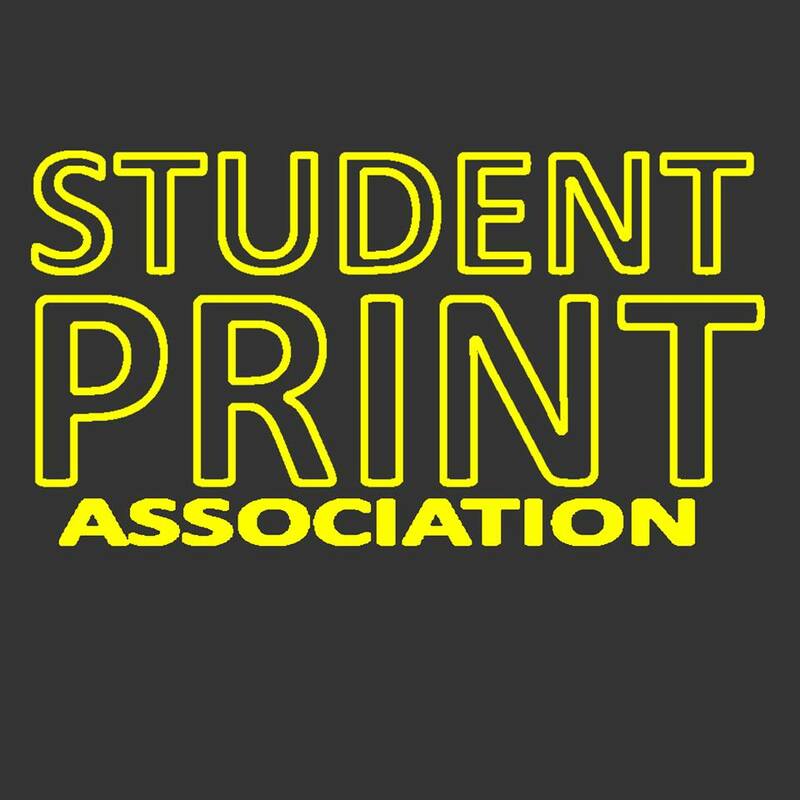 During this time the artist is expected to interact and engage the student population in the print shop. Possibilities to accomplish this are through demonstrations, an artist talk, studio visits critiques and printing assistance etc. Artists unfamiliar with Printmaking methods will be provided with assistance in printing and learning print techniques through scheduled assistance with students, grad students, and faculty. SPA will retain 20% of all editions created within the shop while the artist is in residence. How to apply: please send 10-15 images of work in jpeg format, no image should exceed 2mb in size; proposal for how you would make use of the printmaking facilities; Artist Statement and current CV to Marty Azevedo, Azevedo.7@osu.edu, with “PRINTMAKING ARTIST IN RESIDENCE” in the subject line. The one- month residencies will run starting November 2013 and will continue through May 2014 with the possibility of a longer residency through summer 2014.